Juneau Empire, Dec. 29, 2013: […] the king [chinook] salmon — has fallen from its throne. […] Alaska has seen unprecedented declines in recent years […] scientists like Joe Orsi and Jim Murphy, both fisheries research biologists with the National Oceanic and Atmospheric Administration, are digging deeper into […] the cause of the startling downward trend. 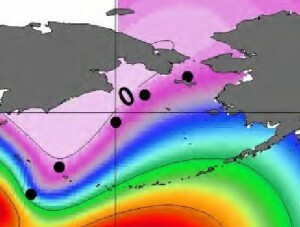 […] When asked about the potential impact Fukushima may be having on king salmon stocks in the Gulf of Alaska and elsewhere in the state, Orsi would not comment. “I’ve been told to refer you to the (Environmental Protection Agency),” he said, “Because I’m not an expert on the topic.” Calls and emails to the EPA were not returned in time and digging on the federal agency’s site revealed no current information on radiation from the Fukushima disaster. The last posted monitoring results occurred in June of 2011. Seattle – US regulators on Thursday ordered a ban on all commercial salmon fishing off California, Oregon and Washington in an emergency effort to help the decimated salmon population to recover. Under the terms of the ban only limited recreational salmon fishing will be allowed on holiday weekends off the Oregon coast. 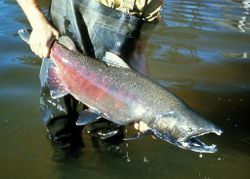 According to official figures the salmon stock is at a historic low point as fewer and fewer fall chinook, or king salmon, have been returning to the Sacramento and Klamath rivers, over the last three years. The dismally low numbers have not been seen since 1954 and 1964, state officials say. Fishermen and scientists blame three main factors for the shortfall. Mismanagement of the rivers, whose waters are often dammed and diverted to irrigate fields; overfishing, and the absence of up normal ocean upwelling – which usually stirs up tons of the ocean’s offshore nutrients which are the essential food needed by young salmon to survive.